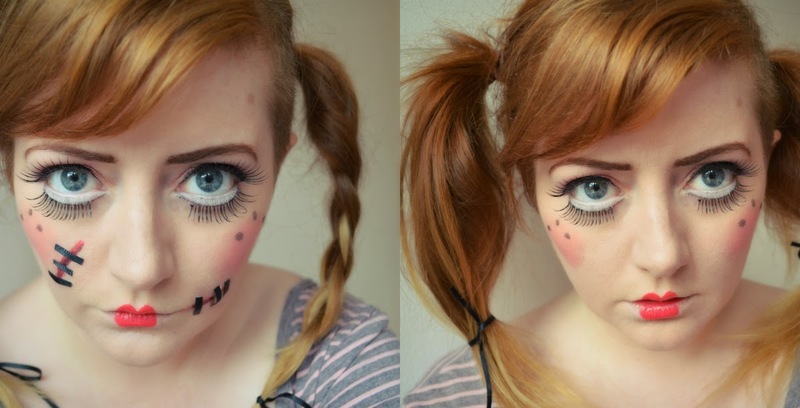 Next up in my halloween tutorial series... how to turn yourself into a creepy doll! To start, put on foundation and cover up any blemishes. 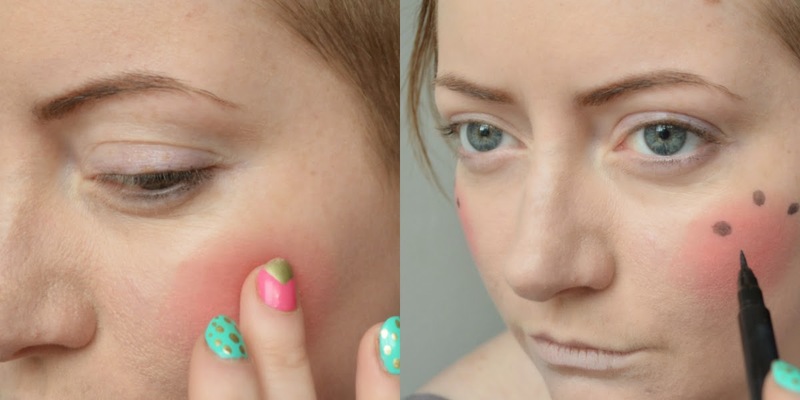 Use a super pink blusher and build it up until you have very bright pink circles on your cheeks. Use a black eyeliner (I used an Urban Decay pen, which is great!) and draw three large dots on each cheek. Use pink eyeshadows to make a soft smokey eye (I used colours from a Sleek palette). Then use a white eyeliner pencil to colour in underneath your eye - this will create the illusion that you have massive doll eyes. Underline the white with a thin black line. Again, I used a pen-type eyeliner for this, but liquid or pencil liner will work as well. Place false eyelashes along the black line. At this stage I also tidied up my eyebrows and added another set of false lashes to my top eyelids. 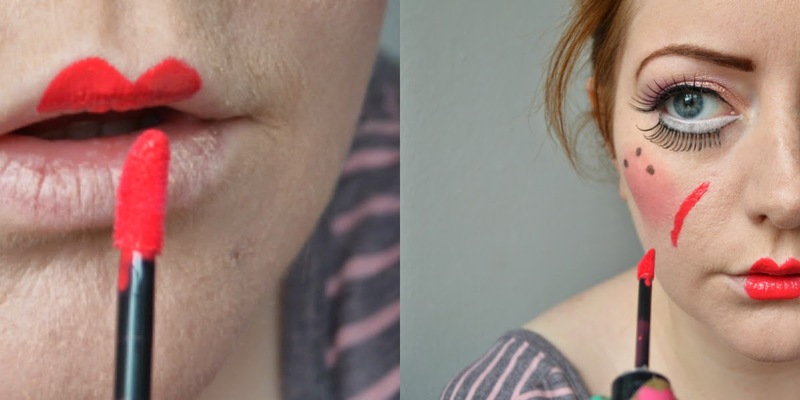 Use bright red lipstick to create a doll-shaped mouth. 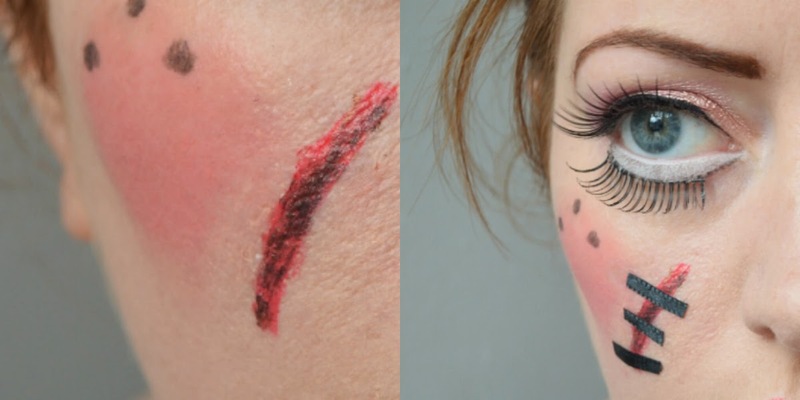 Then to make your doll face even creepier, use the lipstick to mark out several cuts across your face. Dab the cuts with some black eyeshadow, just to make them look a little grungier. Take your ribbon and cut it into small strips. Use eyelash glue to stick these to across the cuts to make stitches! A thick thread would be even better for this, but I just improvised with what I had in my flat. A tip for sticking it on - glue one end, attach to your face, then glue the other end. Much easier than trying to do it all at once! And there you have it! 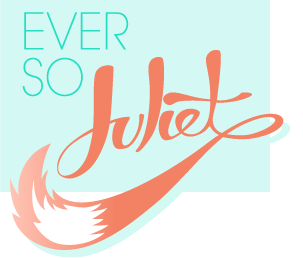 I like the stitch effect, but you might prefer to go without, so here's how they both look. 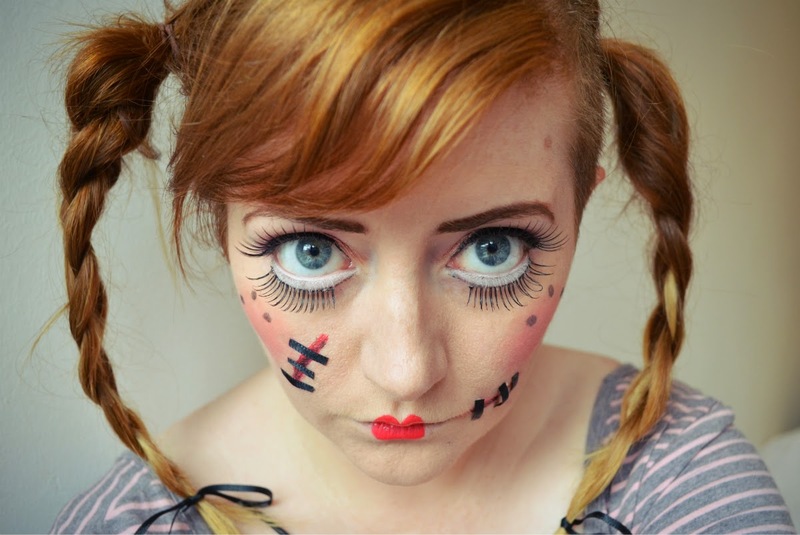 Practise doing big doll eyes, put your hair in big bunches or plaits, and wear with a lacey cream dress.